3nity Media Player is a highly portable multimedia player capable of reading most audio and video formats (MPEG-2, MPEG-4, H.264, DivX, MPEG-1, mp3, ogg, aac ...) as well as DVDs, Audio CDs VCDs, and network streams. 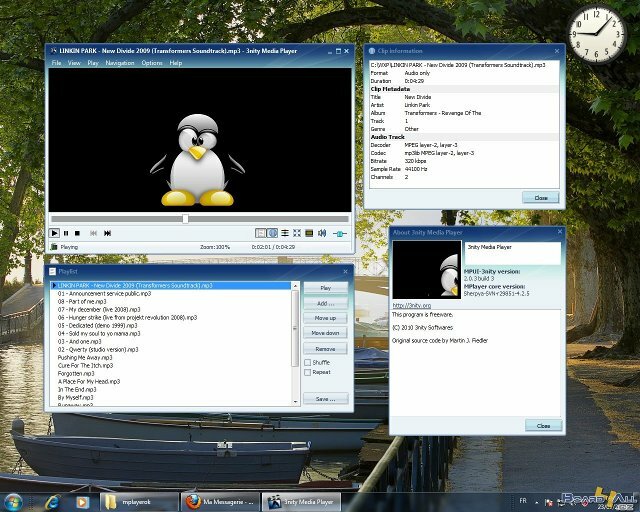 3nity Media Player is a graphical user interface for mplayer. It's based on MPUI by Martin Fiedler. It's a free software. It can play any audio/video file that mplayer supports, that's about 99% of all media files you can find. 3nity Media Player Portable is a highly portable multimedia player. *Plays hundreds of different video and audio formats, including MPEG-1, -2 and -4 (DivX), H.264, MP3, Ogg Vorbis and AAC (More than 192 Video- und 85 Audiocodecs supported natively). For most media files, no additional codecs are needed (Binary Codec Package is already include). *The most important MPlayer options (aspect ratio, deinterlacing, and postprocessing) can be configured without typing in cryptic command-line options. (But if you want or need some non-standard options, you can still add them by hand). *Support for multiple audio and subtitle tracks on DVDs. *Plays files, network streams and discs (such as (S)VCD or DVD). Drag&Drop supported. *Multilingual user interface : english , french , spanish. *No installation is required to use MPUI/MPlayer. Simply copy the two .exe files into a directory of your choice an run MPUI. Qweas is providing links to 3nity Media Player Portable 2.1.0.8 as a courtesy, and makes no representations regarding 3nity Media Player Portable or any other applications or any information related thereto. Any questions, complaints or claims regarding this application 3nity Media Player Portable 2.1.0.8 must be directed to the appropriate software vendor. You may click the publisher link of 3nity Media Player Portable on the top of this page to get more details about the vendor.